Palm Springs, CA – February 13, 2011 – The Canada A’s and the Palm Desert Coyotes kept pace with each other in the California Winter League standings, each gaining a victory in Sunday’s games. In the opener, Coachella Valley Snowbirds starter Masahisa Morita and A’s starting pitcher Taylor King matched each other through the first five innings. Both showed great control, with a low pitch count and over 75% of their pitches thrown for strikes. Canada got on the board first in the third inning. Drew Taddia singled with two outs, scoring Brian Bistagne. Coachella Valley tied it in the fifth when Stefan Neece drove in Drew Boyd with a base hit. In the bottom of the sixth, the A’s regained the lead on a double by catcher Sam Wiley that plated Bistagne. They added two more in the seventh, when Brian Ivan scored on a Scott VanDusseldorp triple, who then scored on a double by Bistagne – all part of a two-out rally off of Snowbirds reliever Tukasa Kozono. King finished the morning with 11 strikeouts – equaling a CWL game-high this season. He allowed only two hits and did not walk a batter in his eight innings of work. Mike Steir and Bryan Wilde closed the door in the ninth. Wilde notched his second save of the season, giving Canada the 4-1 win. The afternoon affair was quite a different story. The Palm Springs Chill got out to an early 2-0 lead when first baseman Mike Olsen deposited one over the center field wall for a two-run homerun, his second of the season. But the Coyotes erupted for ten runs in the fifth inning, three in the sixth and two more in the seventh to run away with the 15-4 victory. Marcus Dennistoun, Wesley Hoskins and Jeff Vires all had doubles for Palm Desert. Andrew Martirano had a triple. In all, 13 different players scored at least one run. Monday is an off day. All teams resume action on Tuesday with the Palm Desert Coyotes (9-7) and the Coachella Valley Snowbirds (7-8-1) at 1 p.m., followed by the 5 p.m. game featuring the Canada A’s (10-6) and the Palm Springs Chill (5-10-1). Tuesdays are $1 Beer Days at the ballpark – all Budweiser draft beers are only $1 during both games. 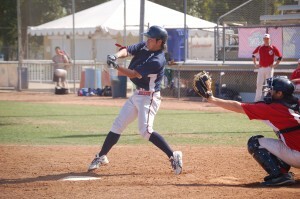 All games can be heard live on the CWL website, at www.CaliforniaWinterLeague.com. Saturday’s Championship Game will be simulcast on Newstalk 920 KPSI starting at 1 p.m. All games are played at historic Palm Springs Stadium, located at 1901 E. Baristo Road in Palm Springs. 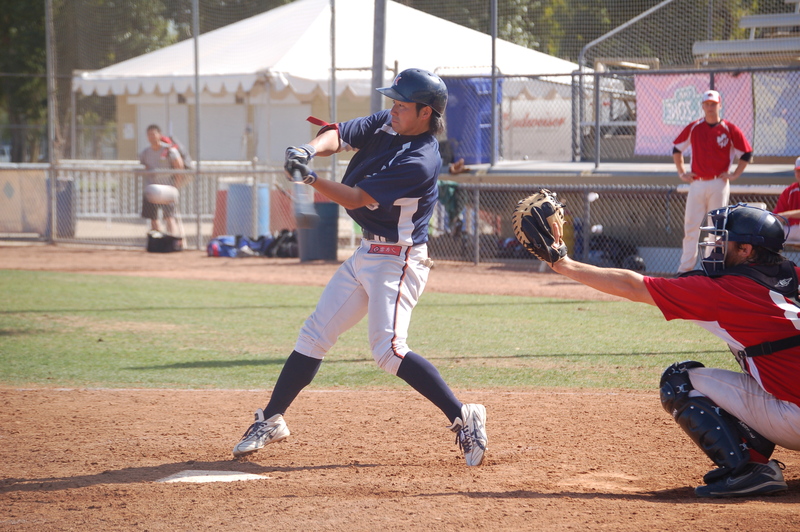 Snowbirds infielder Hiroki Inaba singles in the ninth – one of only three hits for Coachella Valley on the day.